The bombogenesis that hit Nebraska last week was no joke, blizzard on one end of the State, historic flooding on the other… Evacuations continue in Nebraska, Iowa, Missouri and Illinois due to the worst flooding in decades. 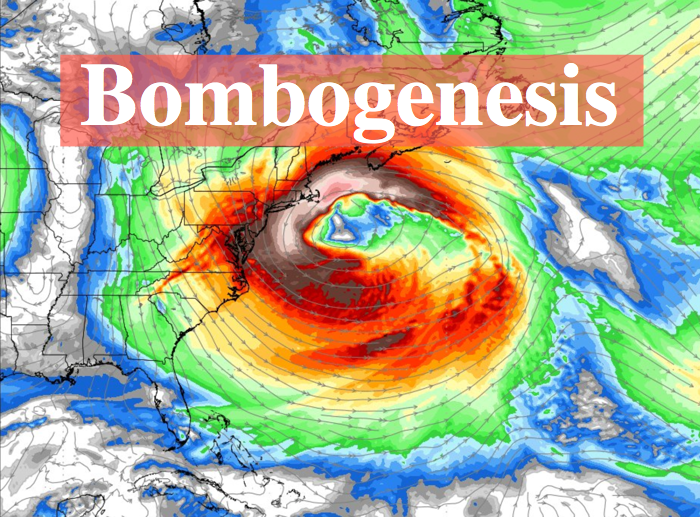 Same thing now for northeastern US this week?In any cases… If they are telling you a bomb cyclone is possible, head the warnings and be prepared! A storm destined to become the next ‘bomb cyclone’ for the United States will target the Northeast with high winds from Friday to Saturday as cold air blasts through the region. In order for the strengthening storm to be dubbed a bomb cyclone, the barometric pressure at the center of the storm must plummet 0.71 of an inch of mercury (24 millibars) in 24 hours. This storm may reach that criteria as it moves northward and intensifies from Thursday evening near Delmarva to Friday evening in southern Maine. The storm will first deliver areas of drenching rain, flooding and heavy snow to end the week. However, the most far-reaching impact of the storm will be on its tail end in the form of very blustery conditions and a return of colder air. While perhaps not as strong as the wind event during late February in the Northeast nor as strong as the hurricane-force gusts over the Central states last week, winds will pack a punch from Friday to Saturday. People should be prepared for power surges and localized power outages. Wind gusts in the neighborhood of 40-50 mph will be more common. However, much stronger gusts close to 60 mph cannot be ruled out, especially over the ridges and high bridges in the region, as well as through the gaps in the mountains, along the shoreline of the Great Lakes and even between tall buildings in the cities. The powerful winds are forecast to affect areas from the Great Lakes to the central Appalachians on Friday then spread toward the mid-Atlantic and New England coasts by Saturday. The high winds can flip over large trucks and cause significant low-level turbulence for airline passengers and tricky landing and takeoffs for pilots. Winds will subside from southwest to northeast across the region from Saturday evening to Sunday. In any cases… If they are telling you a bomb cyclone is possible, head the warnings and be prepared!